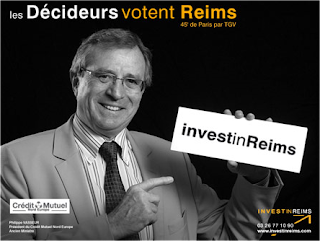 Would you Invest in Reims? Reims (or Rheims in English), as one of the biggest towns in France, has also taken up the challenge of planning and putting into action their own territorial marketing plan. Historically speaking, this town is where the French Kings would come for the crowning ceremony, and it is this town that made Joan of Arc truly famous when she delivered it for the King. Moreover, through time, the town has maintained its status as a landmark both in French history and in French economy thanks to its easy access by car (excellent access to motorways), train (4 train stations), boat (canal link to the Marne and Seine rivers) or aeroplane (1 airport and the fret and passenger Paris-Vatry airport 55km away). It is also not far from the French borders of Belgium, Luxemburg, Germany and Switzerland. 7 years ago, when the agency invest in Reims was created by the local chamber of commerce, the main goals were to enable companies to start a business in the region and save around 10 000€ per year and per employee as well as increase productivity by 10% and slow down turnover by 15%. These objectives can seem quite ambitious for local authorities as we could imagine that the money saved by the companies would be money spent by the authorities. 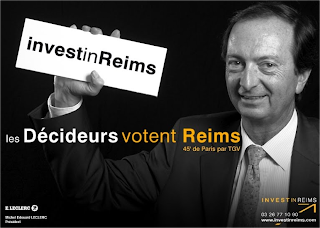 As it turns out, the agency Invest in Reims says that it has managed to reach these objectives and that it has help in the establishment of over 80 companies and the creation of around 40 000 jobs in the region. In terms of actual help provided to companies, the agency provides welcome support for recruitment, formation, finding offices etc. ; reductions and financial aid for recruitment and formation ; up to 4 000€s financial aid for every job created. For the employees the agency offers help in finding lodgings, a job for the husband or wife, or help in finding schools for children. The actual marketing campaign is quite simple: the logo is simple text with an arrow pointing towards the top right hand side corner. The colours are golden yellow on black. The pictures used are pictures of the entrepreneurs who trust the town, in black and white, holding up the logo “INVEST in REIMS”. The whole concept is based upon the idea that the agency really does help the individual. The website, also a bit simplistic, does have interesting animations and videos describing the different choices the viewer has. The only downside is the lack of information and the poor English accent of the actor used in the videos. Overall there is very little to say apart from the fact that, despite very small use of visual advertising, Reims has actually done a very god job of Branding its region to companies and entrepreneurs. Indeed, it has successfully assembled a good number of companies under the same brand and offers very interesting services and financial help to new companies. Shorter is beautiful! Investissez a Reims or Invest in Rheims look weird, doesn't it? Besides, who knows except advanced learners of English that we say - Rheims, Lyons, Marseilles. Even in French and Russian news they wrote Mumbai, which is a shame. The logo is to please local authorities. Put an arrow going up, you're never wrong! From my kitchen, I would have thought of something with Champagne, bubbles, success, race winners !